Getting enough protein while on a liquid diet can be challenging, but it is not impossible. Depending on the type of liquid diet, there are protein-rich foods that can be included. Some of these can be purchased, and others must be prepared from scratch. Therefore, getting enough protein is a matter of creativity, resourcefulness and some basic cooking skills. There are a two types of liquid diets; which one you are on will determine what types of protein sources you can include. The Institute of Medicine recommends a daily protein intake of 0.8 grams of protein per kilogram of body weight. To calculate your specific needs, take your body weight in pounds and divide it by 2.2. Then multiply that number by 0.8 to get the total number of grams of protein you need to consume each day. The average daily recommendation is around 56 grams for a 160-pound adult. After surgery, when liquid diets tend to be administered, protein requirements can increase to as much as 2.0 grams of protein per kilogram of body weight. A clear liquid diet permits only foods that are clear fluids or become clear fluids at body temperature, such as juice, gelatin, tea, ice pops and broth. A typical clear liquid diet can provide approximately 600 calories and 6 grams of protein, according to Jackson-Siegelbaum Gastroenterology. But the powdered soup broth typically offered on this diet, such as beef bouillon, only provides around 1 gram of protein per serving. 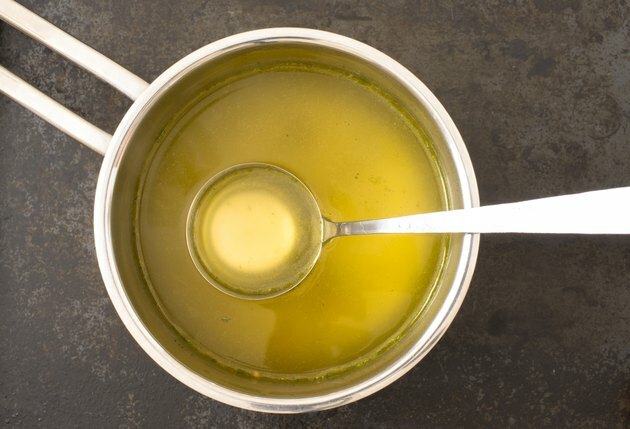 You can make your own strained meat stock or purchase fat-free canned broth that is higher in protein than bouillon to increase protein intake. For example, homemade chicken stock and canned fat-free soup broth both contain around 6 grams of protein per cup. A full liquid diet includes everything allowed on the clear liquid diet plus strained creamy soups, milk, ice cream, dietary supplement shakes, pudding and yogurt. Medline Plus also states that the nutritional goal for an individual on full liquids should be 1,350 to 1,500 calories and 45 grams of protein per day, but this can be adjusted to meet higher needs. Dairy products such as yogurt, milk, meat stock, cream soups and meal replacement shakes are all appropriate protein sources for this diet. Clear liquid diets are typically used in preparation for a medical test or surgical procedure. It is important not to pursue a clear liquid diet for longer than three to five days because the types of foods permitted cannot provide enough protein or calories to meet your needs in the long term. A full liquid diet, however, can provide adequate protein and can be pursued for a much longer period of time -- as long as you are being monitored carefully by your doctor. Can You Live on a Liquid Diet?